Desperate times call for desperate measures, although I'm certainly disappointed that things have gotten this bad. I was in the process of booking a charter for next month, on the assumption they'd only cut it down to 1 fish per person per day. Will take a raincheck until the summer and hope that our favourite charter guy is still in business then. Anyone have any good Seal recipes? They closed Chinook retention / salmon fishing on the Skeena last year and delayed opening the remaining salmon fishery until late July. I was up there in August and many people I spoke to supported the decision. Others were only pissed they couldn't fill a freezer in 2018. I'll survive for a year or two without Chinook. I'll just have to learn to stomach more trout for a bit. After hearing so many people speak of the good old days, where there used to be way more fish years ago compared to today, it seems to have been obvious for a long time that things were trending in this direction and that we would end here.......but that's just me...I seldom view rec fisherman release all salmon caught that they could otherwise keep in the name of conservation...a few but not many....and most likely because they wanted a fresher/claner fish to kill. So to show outrage over a lack planning/action by DFO for some years, and a sudden closure/severe restriction is kind of silly, and its only an attempt to pass the blame onto others. If it was known/believed that stocks were declining and not what they used to be, why did we continue to keep fish and not change our habits as rec fisherman? I'm guilty of this too btw...people have a tendency to pillage a resource until we can't, and then get pissed about it. At least it looks like we get catch and release, so those who are out just for the love of the sport will be just fine....Nooks are the new Steelhead....be satisfied with a Chinook pics I guess. I cant find the study now buy I remember reading in it that a large % of our adult Chinook are caught in Alaska waters before making it back to BC? Also ive seen some gill nets drifting out in mission the othet day lol. Springers!! I've seen the nets oit as well. I just assumed they were out for Oolies. the pan handle chinook fishery was shut down early last year to protect Canadian fish. Virtually all the fish there are 'Canadian' fish from Canadian spawning sites though in many cases the last mile or so of the river is in Alaska. Those numbers would also include the Yukon River where something like half the total number of return fish originate in Canada. Re: Draconian Fisheries Closures -WCVI Inshore? 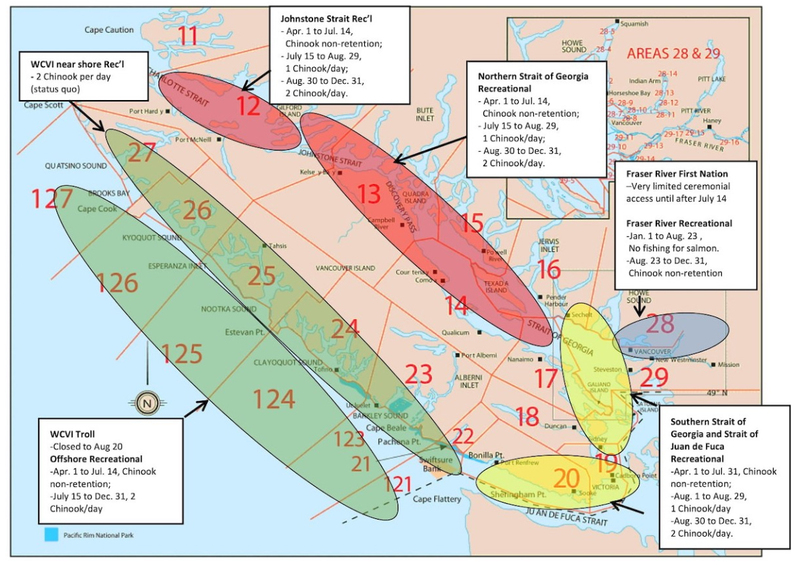 Does anyone know for sure what the West Coast: Near Shore guidelines are? Is it 2 per day currently and throughout the season? or 2 per day after some closure period? "What are YOU going to DO about the salmon crisis?" Good question - didn't it say something about "after stocks of concern have passed through" or something like that? The article in the first link (seawestnews) seems to show inshore hasn't changed from last year - 2 per day. The map near the end of the article has the info. Which makes sense since this is designed to protect Fraser Chinook. Inshore fish are probably headed to their spawning river on the Island. we'll continue all other harmful practices that kill fish in millions... but, you can't take an extra fish out of the ocean. Understand that the Minister’s decision has been made and will not be reversed. What we were trying to achieve was a better understanding of his intentions and if there was flexibility or room to tweak some areas. Opened the meeting with significant discussion expressing our extreme disappointment and betrayal. Followed by the immediate and long term effects of his actions. Noted that his statement that “Pacific Chinook” were in a critical state was a lie and very misleading to the public. Many stocks are doing very well. His message basically told the world not to come to BC for fishing. Accepting that he is not going to reverse the decision, how can we work with it to reduce damage. A: As the stock of concern travels off shore on the west coast, we requested that a one mile surf line be applied to the west coast allowing communities like Port Renfrew and Tofino to have a fishery. This was well received and the open for discussion. B: Would he consider changes or moving dates eg: open for Canada Day. Pretty hard no on this one. C: No reason to close Georgia Straight inlets as there is no science indicating the stock of concern are there. Well received and under consideration. D: Selective marked fishery. If we are allowed to fish but not retain wild salmon why would we not be able to keep a hatchery salmon should we catch one. This one has nothing to do with conservation in the ocean and is a FN issue. DFO wants to keep the nets out of the river until July 14 and if rec anglers are retaining “any” salmon... then FN has a constitutional right to as well. A selective marked fishery would require support from FN. This one is not off the table but will be a tough one to get approved. E: How do they plan to implement the new 10 fish annual limit when many people have already purchased their license and it has 30 on it? This one was challenging for them. Not sure what they will do. F: Lots of other discussion including no fin fish area from Otter to East Point should be open for Halibut etc. Other potential opportunities to reduce the damage. We will be getting back together soon to review these possible changes and hopefully expect to see some variance orders to the regs. Expect the Fisheries Notice to come out today with Variance Orders to follow for any changes. Now there is a complete load of horse$hit for you! There are FN nets in the river, for a DFO sanctioned opening on "threatened" early ruin springs, right now, and open for seven days. WTF do they think they are fooling here?? In discussions with both Fisheries critics yesterday, it is quite obvious there will be no turning back from this. At least this year, and likely for five. I am uncertain what, if anything the Conservatives would do to lighten the impacts, but I have asked, and will post if / when I get a response. Whole thing is a travesty. Already (as in NOW) DFO is "letting" some Fraser Bands commence with a week's effort directed on early run (threatened) springs. That sector is by far the most responsible for the downward spirals of most spring populations. Area G (me) has conclusively shown that our impact in May is less than ONE percent Canadian origin, but we get yanked. Many of the recreational fisheries can indicate the same, but they get yanked. The FN's are told they will have to wait until July 15, but then they get targeted openings. And while this whole scenario is being developed, DFO quietly sneaks in a new branch, complete with RDG, support staff and funding. Title of this new entity? In direct response to Budget 2019 commitments to support our capacity to work with Indigenous groups and advance reconciliation, I am reaching out to you to share some news about planned organizational changes that we are making at Fisheries and Oceans Canada, Pacific Region, to help position us to build on our established relationships with Indigenous communities and organizations across the Region. I am pleased to share with you that we are moving forward to create a new team in Pacific Region dedicated to work across our diverse departmental branches to advance reconciliation. The name of this new team -- Reconciliation and Partnerships (R&P) Branch -- reflects the outcomes we want to achieve. My hope is that R&P will provide the Region with strategic support as we continue our work of strengthening our relationships and translating the Government’s high-level reconciliation priorities into specific, concrete and coordinated actions in our day-to-day work. “Partnerships” in the branch title name highlights the need not only to create partnerships with Indigenous communities to achieve our reconciliation objectives but also to work closely with our industry and recreational partners to ensure that these objectives are realized. Achieving reconciliation will require strong relationships between the Department and industry, governmental and non-governmental organizations and other bodies interested in resource management, all of whom play a role at helping to realize reconciliation. In the upcoming months, our new Regional Director of R&P, David Didluck, will be seeking opportunities to meet sector advisory and management groups to discuss his work. Rest assured that your key DFO program contacts will not change. I look forward to building on our relationship through further engagement to advance reconciliation and partnerships through fisheries and aquatic management. Life, as I knew it, is over.